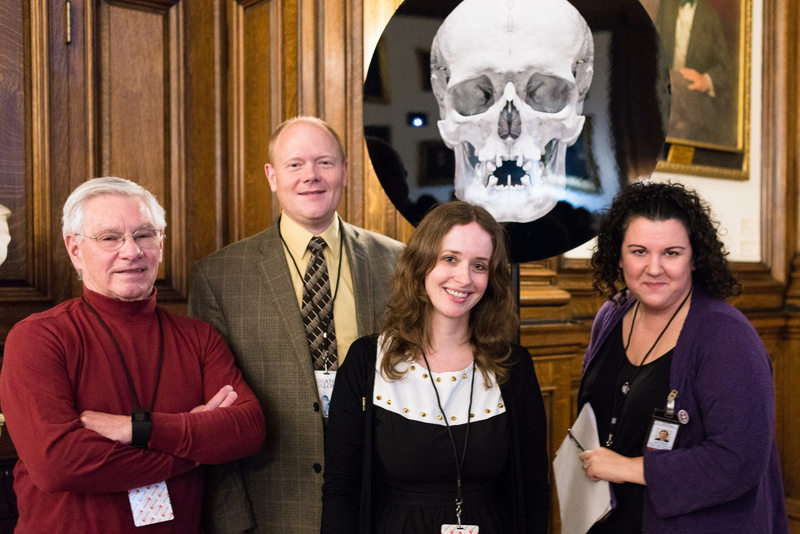 The Anthropodermic Books Project team: Chemists Daniel Kirby & Richard Hark, Megan Rosenbloom, & Mutter Museum curator Anna Dhody. Photo by Scott Troyan. Megan Rosenbloom is part of a research team undertaking an exciting project on an unusual topic in the field of antiquarian books and the history of medicine. Anthropodermic bibliopegy, or books bound in human skin, are some of the most mysterious and misunderstood books in the world’s libraries and museums. The historical reasons behind their creation vary: 19th century doctors made them as personal keepsakes for their book collections or at the request of the state to further punish executed prisoners. Persistent rumors exist about French Revolutionary origins as well. The best evidence most of these alleged skin books have ever had were rumors and perhaps a pencil-written note inside that said “bound in human skin”… until now. This team has developed an easy, inexpensive, and truly authoritative method for testing alleged anthropodermic books to see if they’re of human origin. The goal is to create a census for the alleged anthropodermic books of the world and test as many as possible to learn the historical truths behind the innuendo. To learn more, visit The Anthropodermic Books Project website. Megan Rosenbloom’s book about the history and ethics surrounding this practice, Dark Archives, will publish with Farrar, Straus & Giroux.